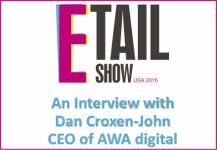 You can now download our interview with Dan Croxen-John, CEO of AWA digital, and then join us for the Etail Show USA, taking place April 8-9 in Atlanta, GA.
AWA digital is a full-service conversion agency, helping companies make their websites easy to buy from. We’re glad to have them as a Silver Sponsor at this year’s Etail Show USA! Come by Booth 413D in the expo hall to find out how they can help you overcome your eCommerce challenges.